NEW YORK Apple (AAPL) is seeking a patent for an iPhone that has a display that wraps around the edges of the device, expanding the viewable area and eliminating all physical buttons. The patent application reveals that Apple has put some thought into a device that takes advantage of a new generation of displays, which don't have to be flat and rigid like today's liquid-crystal displays, or LCDs. At a trade show in January, chief competitor Samsung Electronics showed off a prototype phone with a display that is bent around the edges, presenting "virtual buttons" for the user's touch. 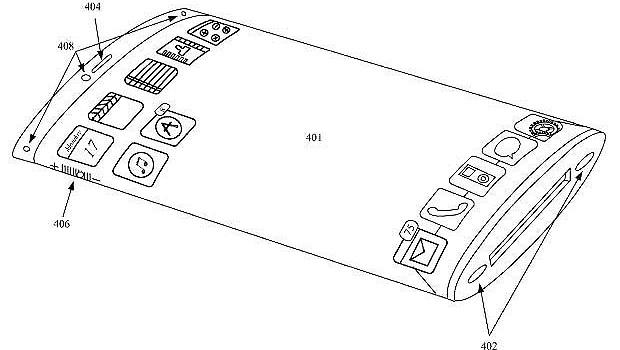 Apple's patent filing shows a phone similar to a flattened tube of glass, inside of which a display envelops the chips and circuit board. This allows "functionality to extend to more than one surface of the device," the filing said. The design also means there's no frame or bezel surrounding the display, meaning it can take up more of the device's surface area. The company filed for the patent in September 2011, though the application became public only Thursday. Like others, Apple often files for patents on designs that never come to fruition. It also doesn't comment about future products until it's ready to launch.